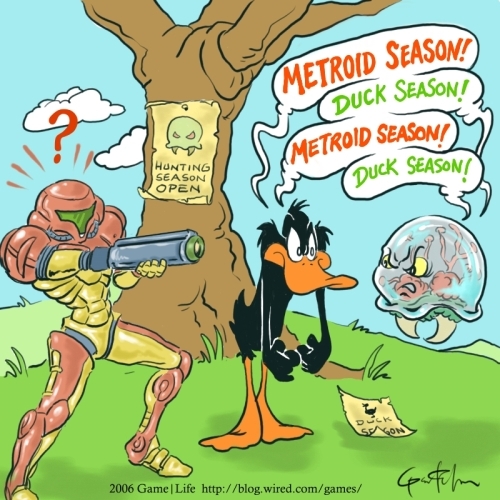 When suddenly daffy pulls off paper on tree to reveal: Samus Aran season, Daffy and Metroid pick up Ice-Beams and turn to Samus. Tee Hee. Samus is racist. She'll shoot the metroid either way. lol! I've never thought this would be so funny...lol! This is without exaggeration.... this reference is absolutely godly, and is my new favorite picture. Kind of hypocritical since she's part metroid. Not by that point, though I doubt there'd be a change of allegiance anyway. If I recall, in Fusion the Metroids no longer attack her and she doesn't attack them. Except for that last one that finishes of X-Samus and then tries to eat Samus. so its like the Highlander, but with metroids? Actually, that's an Omega Metroid. This discussion made me notice Metroid Fusion seemed to be kinda of an Alternate Storyline. Seems the Metroid story will follow around Metroid Prime storyline. I don't think anyone has said they're alternate story lines. Fusion is the chronological end of the games, if they ever continue it, they'd have to figure out how they'd work the old man in, and how they'd find any more metroids to kill. Prime took place between Metroid and Metroid II, and was written by Americans. Do you want to freeze him now or wait till you get home? In Other M it turns out that the Baby Metroid had the genetic coding to evolve into a Queen. Samus got DNA from the Baby Metroid and the Omega Metroid in Fusion was cloned from the Baby. It could thus evolve into a Queen eventually. So the Omega could indeed have seen Samus as a rival for the 'throne'.